The Southern Plains bumblebee (Bombus fraternus) features in this month’s Bumblebees of the World blog, with a particular focus on how the species’ endangered conservation status was classified by the IUCN’s Bumblebee Specialist Group (BBSG). Colour pattern: Queens and workers are predominantly pale straw-coloured yellow with a black band between the dark wings and an extensive black tail. Males look similar, although can be more extensively yellow between the wings and have very large eyes. 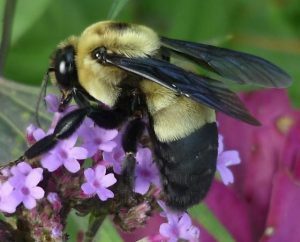 The Southern Plains bumblebee is found to the east of the Rockies, across the prairie lands in the south of the Great Plains, stretching to the coastal plains of central Florida and New Jersey. With pale yellow and black banding, this short-tongued bumblebee has a similar colour form to a number of North American species, however it is has a very distinctive look, with extremely short and even hair across its body. 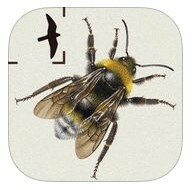 This gives the bee a very close-cropped and neat look overall – almost like a bumblebee with a (forgive me) buzz cut! Some of the hair on the abdomen is completely flattened to the body making the abdomen look slim and sleek in comparison to other fuzzier bumblebees. The IUCN-BBSG last assessed the conservation status of this species in 2014, when it was classified as endangered. Their justification came down to three main factors – relative abundance, which is a measure of how many records of this species there are in relation to the total number of species recorded, a change in its extent of occurrence, which relates to the species’ overall distribution, and the loss of suitable habitat within the species’ known range. The IUCN-BBSG team took historical national bumblebee records and plotted the Southern Plains bumblebee’s relative abundance at 10 year intervals to understand how it had changed from 1912 to 2012. 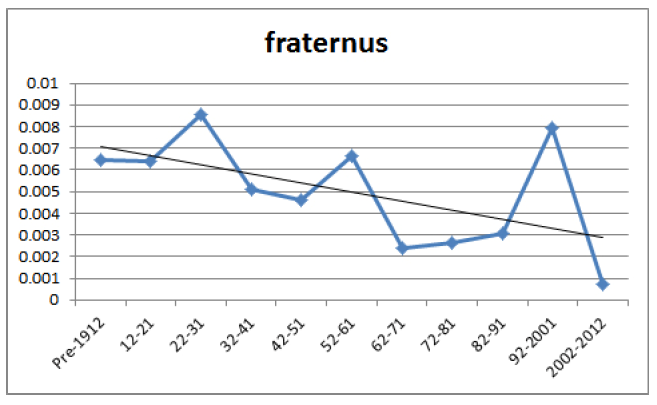 The figure below shows a historical downward trend which is close to being statistically significant. If the trajectory were to continue at this rate, the assessors warn the species could potentially be extinct within the next 80-90 years. Figure 1. 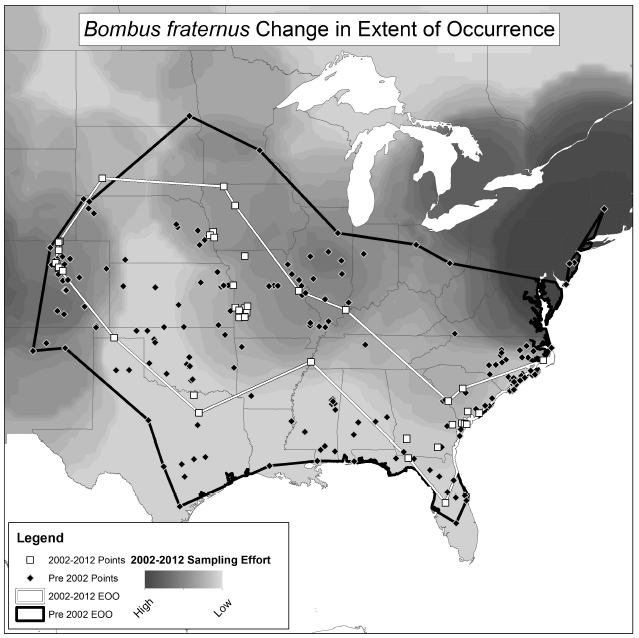 Bombus fraternus relative abundance trends from 1912 to 2012. From: Hatfield, R., Jepsen, S., Thorp, R., Richardson, L. & Colla, S. 2014. Bombus fraternus. The IUCN Red List of Threatened Species 2014: e.T44937623A69001851. http://dx.doi.org/10.2305/IUCN.UK.2014-3.RLTS.T44937623A69001851. Downloaded on 05 April 2019. The decline in relative abundance since 2002 was consistent with a decline in distribution. The team mapped historical records and compared them with records post 2002 to understand the extent that the species still occurs across its known range. After taking care to avoid statistically overestimating range loss (by randomly rarefying the much larger number of pre-2002 records), they found that the species had reduced its area of occupancy by 28.62% since 2002. A heat map depicts the amount of surveying that took place between 2002 and 2012. This shows that some of the areas the species has declined from have also been well surveyed in recent times, which gives the team confidence in their assessment that Bombus fraternus has declined in range. Figure 2. Change in the extent of occurrence for Bombus fraternus before and after 2002 with a heat map to show well-sampled and poorly sampled areas. From: Hatfield, R., Jepsen, S., Thorp, R., Richardson, L. & Colla, S. 2014. Bombus fraternus. The IUCN Red List of Threatened Species 2014: e.T44937623A69001851. http://dx.doi.org/10.2305/IUCN.UK.2014-3.RLTS.T44937623A69001851. Downloaded on 05 April 2019. The third area of justification relates to severe changes that have occurred in the Southern Plains bumblebee’s habitat range, particularly since 2002. This period has seen native grasslands converted into agricultural land and increased use of agricultural pesticides. Identifying the negative impact that these changes have had is useful as it helps indicate what needs to change for this species to recover. The IUCN-BBSG identify the following general actions to conserve Bombus fraternus: restoring, creating and preserving natural grasslands, restricting harmful pesticide use within or close to their habitats, and protecting them from diseases introduced by managed bees. However, more research is needed to fully understand the specific requirements of this distinctive species and how best to help it. For those wishing to get involved with Bumblebee Conservation in the U.S. check out the IUCN Bumblebee Specialist Group.